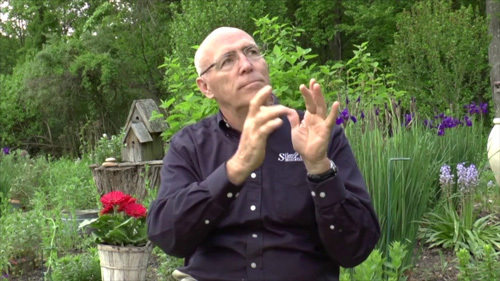 Allen Snare was born Deaf with his hearing twin sister Faye on April 14, 1947. Allen grew up in Huntingdon, Pennsylvania, with his three brothers and three sisters who were all hearing. He attended the Pennsylvania School for the Deaf in Philadelphia and he loved it! He had full access to communication at school. However, access at church was a different story. Allen grew up attending church with no interpreter. He was clueless of what was being said, until one day, in 1968, when he was invited to a church hosting a week-long revival conference. It just so happened they had an interpreter. That was the first time Allen was exposed to an interpreter. Bill Rice III was a visiting Pastor from the Bill Rice Ranch, a ministry with a goal of reaching the deaf through local revival meetings, regional events, and camps. Bill’s wife Mary interpreted while Bill preached that day. "When Bill Rice asked me if I was saved I told him 'I never heard of that before'; even though I grew up in church my whole life. Once Bill Rice explained who Jesus was and how he died on the cross to save us from our sins, so that we can go to heaven and not hell, I got saved..."3 Allen finally understood what being saved meant. Allen was convinced to go to Bible college when he saw an ad for it in the Branding Iron, a newspaper for the deaf from the Bill Rice Ranch. Allen went in 1971, but he felt out of place with only eight other deaf people. In 1975, Allen graduated from Tennessee Temple in Chattanooga. Allen was debating between preaching and becoming a missionary; he felt God called him to be a preacher. Allen pastored in many deaf churches in Texas, Colorado, Alabama, and Ohio. When Allen was living in Texas, he went to Colorado to host a camp revival for a week. While Allen was there, the interpreter introduced him to a nice deaf woman named Debbie. When Allen returned the following Fall, he asked the congregation after he finished preaching who would like to be saved and Debbie came forward. When Debbie got saved, Allen knew she was the one. He and Debbie started dating and they got married on July 22, 1978. 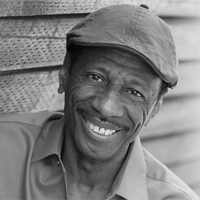 Allen teamed up with Bill Rice III again, the man who first introduced him to an interpreter and helped him to understand the meaning of being saved, when he played the lead role in the movie When Silence Speaks. 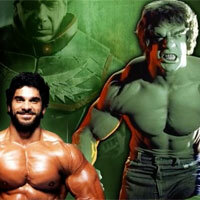 The movie was produced by Bill Rice III and released by Bill Rice Films Production in 1994. It was a fictional Christian movie about a deaf man, Gordy, played by Allen, searching to understand the meaning of the cross. Allen’s son, John, also was in the movie in the role of a young Gordy. Allen pastored in Pennsylvania for 12 years at Faith Baptist Church in Fairless Hills; he thought he would preach there until he died. However, God had other plans; he was let go from that position. Allen reached out to Ted Camp, the founder of Silent Word Ministries and told him he was called to serve with him at Silent Word Ministries. At first Ted was hesitant, so they both prayed about it for a week. Allen contacted him a week later stating "God still wants me to join your ministry. "3 Ted agreed and Allen and his wife moved to Georgia to start serving for Silent Word Ministries in 2000. Allen is still a full-time missionary with Silent Word Ministries. He travels wherever he is called. He’s been to ten different countries for missionaries and to preach at revival meetings. Sadly, Debbie was diagnosed with colon cancer the year he started with Silent Deaf Ministries. 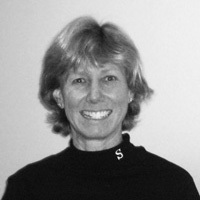 She fought cancer for five years and in 2006, Debbie passed away. Together they raised a wonderful family. They had three children. Their daughter Joy is hearing, and their two sons, John and Justin, are deaf. Allen is now a grandfather of three. He has one deaf granddaughter and a hearing grandson and granddaughter. They all know sign language. You can find Allen’s testimony as well as preaching videos on YouTube. He plans to serve the rest of his days as a deaf evangelist to honor his mission statement: "My Heart’s Desire Is To See More Deaf People Saved." Known as "the fastest woman in the world," Kitty O’Neil was born in Corpus Christi, Texas on March 24, 1946. She became deaf at the age of 4 months. She had a variety of illnesses including measles, mumps and the chicken pox - one or all of which led to her becoming profoundly deaf. Despite her early illnesses, she became a phenomenal athlete. She said, "My mother pushed me to read lips… but she didn’t push me in sports – I did that myself. Because I was deaf, I had a very positive mental attitude. You have to show people you can do anything." She fell in love with swimming and diving. She finished in twelfth place in the U.S. team trials for the Olympics in Tokyo, where she specialized in diving. Her Olympic dream came to a quick stop in 1964 when she became ill with spinal meningitis. She was told the illness would likely paralyze her. She survived spinal meningitis, only to battle two rounds of cancer by her 28th birthday. However, O’Neil wasn’t one to be defeated. 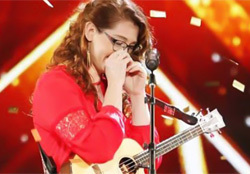 "When I was 18, I was told I couldn’t get a job because I was deaf. 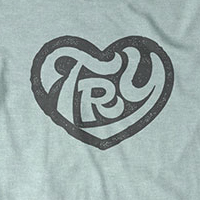 But I said someday I’m going to be famous in sports to show them I can do anything." She lived up to her vow. After regaining her health, she turned her attention to racing and performing stunts. She was small, at 5ft 2in tall and just 97 pounds, but she said her size made her light and quick and better to withstand impact. Most importantly, she was fearless. "I’m not afraid of anything," she said. In 1976, at the age of 30, O’Neil was the first woman to be accepted into Stunts Unlimited, an organization of Hollywood’s top stunt people. She did stunts in TV shows and movies like Quincy, Baretta, The Bionic Woman, Smokey and the Bandit II, The Blues Brothers, and Airport ’77. Some considered her to be like a real-world Wonder Woman and in 1979 she performed her most famous Hollywood stunt as a double for Wonder Woman. She plunged headfirst down 127 feet from the 12-story Valley Hilton in Sherman Oaks, California onto an inflatable air bag set up on the hotel's pool deck. "If I hadn't hit the center of the bag, I probably would have been killed," she told The Washington Post. With the fall, she set a women’s high-fall record, however, she would later beat her own record with a 180 foot fall from a helicopter. Mattel created a Kitty O’Neil action figure in 1978. 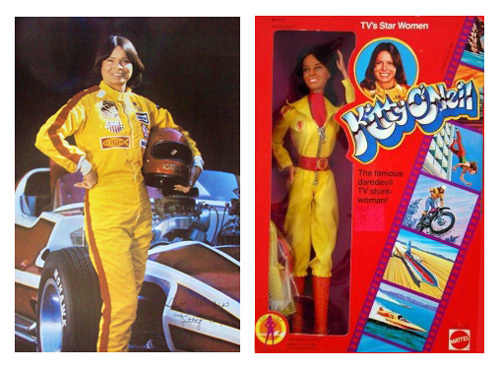 In 1978 Mattel created a Kitty O’Neil action figure and in 1979 a television film was made about her life called Silent Victory: The Kitty O’Neil Story. Stockard Channing stared as O’Neil and, of course, O’Neil did her own stunts. She later commented that about half of the movie was true. From racing boats, cars, dune buggies, motorcycles, a three-wheeled machine, and even holding a record for the fastest speed while waterskiing, she set 22 speed records on land and water during her career. She died November 2, 2018, at the age of 72 in Eureka, South Dakota. 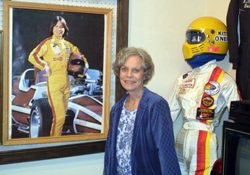 The local Museum in Eureka showcases memorabilia from her career as a stuntwoman and racer. 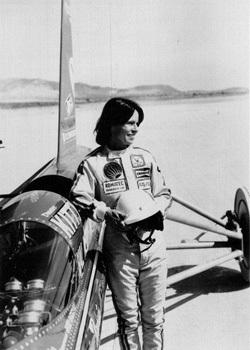 She is still the fastest woman driver ever and continues to hold the land-speed record today. English Sentence: Did you see the movie about the life of Kitty O’Neil, a deaf stuntwoman and racer? ASL Gloss: YOU FINISH SEE MOVIE ABOUT DEAF WOMAN HERSELF FAMOUS S-T-U-N-T WOMAN AND CAR RACER. HER NAME K-I-T-T-Y O’-N-E-I-L. 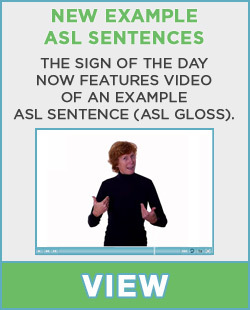 Become a Member of Signing Savvy to see more example sentences signed, including example sentences related to Deaf Culture. Phyllis Frelich was born on February 29, 1944 (on Leap Day) in Devils Lake, North Dakota and was the oldest of her 9 siblings. Like both of her parents and all of her siblings, she was deaf and attended the North Dakota School for the Deaf. 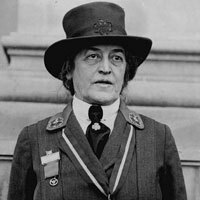 Her parents Philip and Esther were leading members of the Deaf community. They were actively involved with events at the North Dakota School for the Deaf and in the local Deaf community, and also both served as state officers for the North Dakota Association of the Deaf. 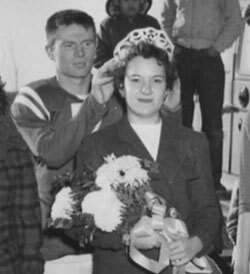 She was a cheerleader and Homecoming Queen at the North Dakota School for the Deaf. When Phyllis showed a dramatic flair in school in North Dakota in the 1950’s, there wasn’t a lot of opportunity or call for Deaf actors. When she went to Gallaudet College (now called Gallaudet University), there was no drama or theatre degree offered, she was discouraged from pursuing acting, and was told repeatedly there wasn’t a future in acting for deaf performers, so she got a degree in Library Science. Her graduation gift, however, was connecting with others who had talent, imagination, and desire, including the group who founded the National Theater for the Deaf in 1967. 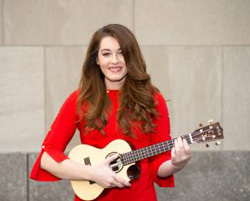 This led to her first TV role on NBC’s nationally syndicated Theater of the Deaf, which was the first television show with deaf actors using sign language rather than mime. Her theatre work reached a zenith in 1980, when she played the leading female role in the Broadway production of Children of a Lesser God, written by Mark Medoff. 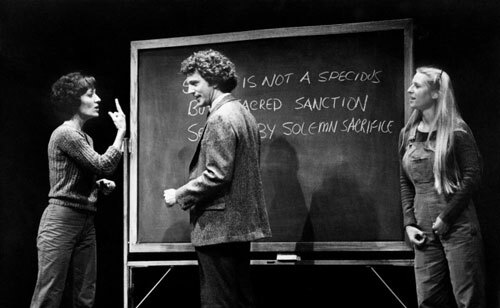 It was about the romantic relationship between a deaf student and her teacher and it has been said that Medoff was largely inspired by the relationship of Phyllis and her hearing husband when he wrote the play. 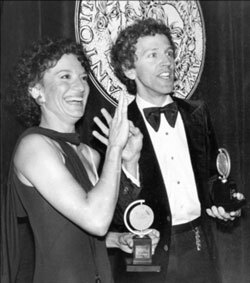 The play won the Tony award for Best Play, and Frelich became the first Deaf person to win a Tony award, for Best Actress. 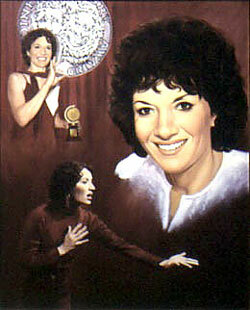 She was also nominated for an Emmy Award for her performance in the 1985 television movie Love Is Never Silent. She made several television guest appearances, on shows including Barney Miller, ER, L.A. Law, and CSI: Crime Scene Investigation. She performed the ASL interpretation of Jewel's rendition of the national anthem at Super Bowl XXXII. She toured all over the world with the National Theater of the Deaf as well as with Deaf West, where she performed in shows like "Big River" and "The House of Bernarda Alba." She also took on gender-switching performances in "The Gin Game" (playing Weller Martin) and "Equus" (playing Dr. Dysart). 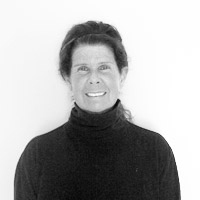 Phyllis Frelich died April 10, 2014, at the age of 70. Her obituary in the Washington Post called her “one of the most prominent deaf actresses of her generation,” citing not only her awards but also her work as the first deaf member to serve on the board of directors of the Screen Actors Guild and her advocacy for the rights of deaf actors. English Example: Phyllis Frelich was a deaf actress and famous for winning the 1980 Best Actress Tony Award for the play "Children of a Lesser God." When he was seven years old, LeRoy Colombo contracted spinal meningitis, which left him deaf and paralyzed from the waist down. His brothers encouraged him to swim, a therapy which resulted in his ability to walk again. Even so, he felt more at home in the water, and found his life’s purpose as a swimmer. At the Texas School for the Deaf in Austin, he broke several swimming records for speed and distance. When he was twelve, he saved a child from drowning, which became the first of many lives he saved. 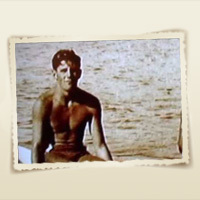 He was also one of the first people to surf in Galveston, Texas. In 1923, Colombo joined the Galveston Toboggan Surf Club, which required members to swim for three straight hours without outside support or floating. He climbed into the lifeguard station perch in Galveston when he was 18, and worked there for over 40 years. He is included in the 1976 Guinness Book of World Records for saving 907 people, although the total number of saves is over 1,000. One of the most dramatic rescues involved diving under burning oil from a tugboat that had burst into flames to save the lives of two crewmen. Galveston Police Chief D.K. Lack said, “He saved more people than I ever heard of or knew. He was one of the greatest lifeguards that ever lived. I know where he saved three people at one time, and once, four. He could sense anything going on in the water and see it before anyone else could. He’s a legend in the city of Galveston” (The Deaf American, 1974, p. 23). In addition to life-saving, Colombo enjoyed endurance racing. In 1927, he swam in a race across the Gulf of Mexico – a fifteen-mile swim. Only he and his brother finished, as the others dropped out from jellyfish stings and exhaustion. Colombo’s time was 11.5 hours, over three hours ahead of his brother. He won all the distance races held in the Gulf of Mexico between 1929 and 1939. After his hearing lost, Columbo struggled in local public school. 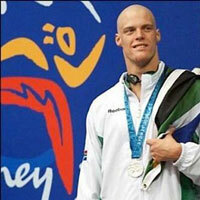 He learned sign language and continued swimming in the indoor pool at the Texas School for the Deaf in Austin. 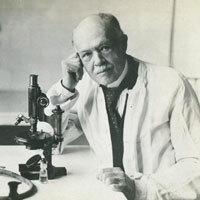 He lived during a time of great prejudice towards deaf people and faced both poverty and discrimination. None of his hearing family or any of the hearing lifeguards that he worked with learned sign language. Yet, he didn’t let other people’s opinions or lack of support dictate what he could do. He loved the water and he loved saving lives. 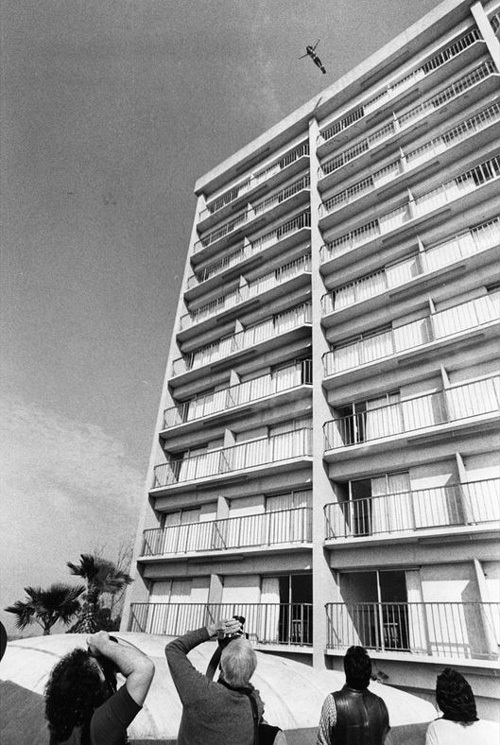 One of Colombo’s greatest contributions, however, was as a living example that deaf people could work as lifeguards. He is cited in literature used in disputes about Deaf people becoming lifeguards, even though there is still discrimination based on fears a deaf lifeguard could not hear cries for help. Today, The American Red Cross allows Deaf people to hold this position, but the YMCA does not. Others argue it was Colombo’s deafness that helped him to be such an acute and successful lifeguard. Some researchers have found deaf people have enhanced visual attention, visual perception, and motion detection skills. One hypothesis is Colombo wasn’t as distracted by the sounds of noisy seagulls, the crashing surf, or people laughing and shouting on the beach. He used his prowess and knowledge of the water, currents and riptides, to quickly recognize people in distress. He retired from being a lifeguard at 62 because of a heart condition, but continued swimming in the Gulf of Mexico a mile a day in both summer and winter for 6 more years, up until a few weeks before he died at the age of 68. Flags in many parts of Texas were lowered to half-mast when he died, he was honored in the Texas legislature with a resolution and moment of silence, and a plaque was erected in his honor at the Galveston beach where he patrolled for over forty years. 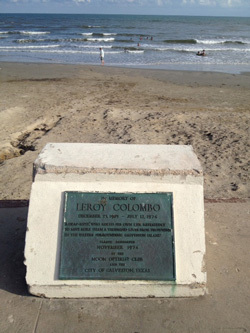 Colombo is remembered today in an annual 5K LeRoy Colombo race held each summer in Galveston. 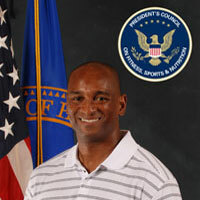 In 2002, Colombo was inducted into the Texas School for the Deaf Athletic Hall of Fame. In 2006, a Texas legislature act enabled the unveiling of The Leroy Colombo Swim Center during the Texas School for the Deaf’s 115th birthday celebration. Some still say he was the "World’s Greatest Lifeguard." 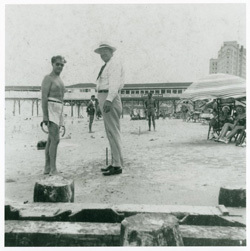 Part 1: Andrews, Jean F. (2010) "Leroy Colombo: The Deaf Lifeguard of Galveston Island Part I: The Early Years (1905-1943)," East Texas Historical Journal: Vol. 48: Iss. 2, Article 9. Part 2: Andrews, Jean F. (2011) "Leroy Colombo: The Deaf Lifeguard of Galveston Island Part II: The Later Years (1943-1974)," East Texas Historical Journal: Vol. 49: Iss. 1, Article 5. Moore, Matthew S. and Panara, Robert F. (1996). LeRoy Colombo: 1905-1974 - World’s Greatest Lifeguard. In Great Deaf Americans (2nd ed., pp. 131-135). Rochester, New York: Deaf Life Press. (1974, October). Death Takes Famed Lifeguard. The Deaf American, 27 (2), 23.